This creamy dessert has three chocolate layers making it a chocolate lover's delight. The chocolate cookie crumb crust is topped with layers of chocolate pudding, whipped topping and crushed cookies. You can't go wrong with this no-bake dessert. Mix baking crumbs and margarine in 9-inch pie plate; press onto bottom and up side of pie plate. Beat pudding mixes and milk in medium bowl with whisk 2 min. ; pour half into crust. Stir 1 cup Cool Whip into remaining pudding; spread over pudding layer in crust. Stir chopped cookies into remaining Cool Whip; spread over pie. Refrigerate 1 hour or until firm. Save 90 calories and 3g of total fat, including 1.5g of saturated fat, per serving by preparing with Jell-O Fat Free Instant Pudding, skim milk and Cool Whip Light Whipped Topping. Prepare using Jell-O Chocolate Fat Free Instant Pudding, skim milk and Cool Whip Light Whipped Topping. 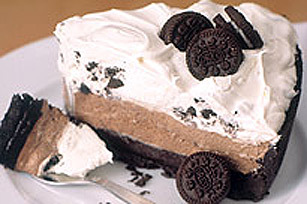 Garnish each piece of pie with 3 additional Mini Oreo Cookies just before serving.